Wishing all our wonderful students and their families a Happy New Year filled with chess! American Youth Return from the World Youth Championship including Shreya Mangalam from Barrington. The USA earned two medals, and they were in the same section. As previously reported, Awonder Liang ran away with the U10 section, scoring 10 points from his first ten games. Though he lost his last game (after achieving a winning position), he still took gold by a full point. 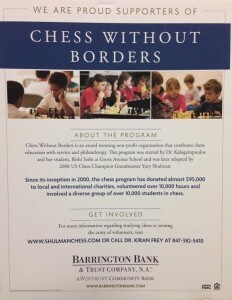 For registration go to: www.shulmanchess.com 100% of the proceeds from the tournament will be donated to 2 programs started by this chess program. 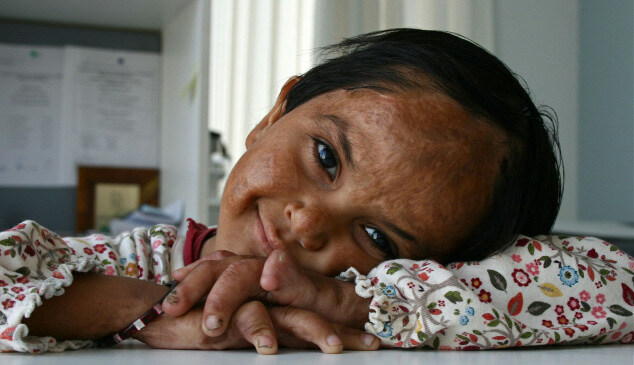 The first project started 6 years ago has provided medical and educational support for a little girl named Meher who lives in one of the slums of Delhi, India. The 2nd project was an offshoot of the first one where we have established a computer center in the same slums of Delhi that is bringing computer literacy to 200-300 families. The computer center has been named after a retired teacher, Maggie Gruber from District 220 who traveled to India to meet this little girl. We hope to produce a 2nd documentary on the computer center and our chess Social Entrepreneurs so please sign a permission allowing us to video/photograph your child. Thank you for making these projects and programs a success. Over the last 3 years Chess Without Borders has sent students to the UN Youth Assembly in New York on the basis of humanitarian projects such as these. You can help by playing in the tournament or joining us for a meal prepared by Gourmet chefs Zein Bertacchi and her sister Rima Said from Jordan. Over 20 volunteers including GM Shulman work relentlessly to make these programs possible. t. Matthews Chess Tournament run by volunteers Joan and Henry Eickelbergs was fun and successful raising $700 ($400 and about $300 in food sales ) for charity. We are grateful for the support our chess families provide for intellectual, artistic and humanitarian growth through such projects for our students.We want to extend a very special thank you to our volunteer Joseph Ridgway who has generously given his time to photograph our students at many tournaments.If you would like to view his photographs please visit: www.shulmanchess.com Extensive scientific research has conducted on people who learn chess. The results demonstrate a positive effect on multiple cognitive, social and emotional skills. For more information on this subject please visit USCF web site.We are pleased to announce our collaboration with the Senior Center in Hanover Park where we donated 4 chess sets so that seniors can learn chess. The chess program will run on Monday afternoons at the Hanover Park Senior Center.Our chess students are invited to take on leadership roles in visiting the center to teach and introduce chess to the seniors. We are inviting our budding artists to practice their music, dance, and plays at Sunrise Senior Center in Barrington. Chess Without Borders will count these hours as service and our students can work towards the Presidential Award through such programs. Please email us at chesswob@gmail.com if you are able to help. Trailor on 22nd of February. A trailer on the computer center will be screened on the 22nd of Feb at Hough School. Produced by Professional Documentarian Dylan Dullea from NY and filmed by Gagan Dang from India. Aadit Bennur thoughtfully donated $25 for Meher’s education this holiday season. Aadit is in 4th grade at the Winston Campus Elementary School in the Gifted and Talented program. He has been taking chess lessons from Yury for a couple of years now. He likes to swim and play the Piano. We deeply appreciate his kindness and are happy that he is a part of our chess family. 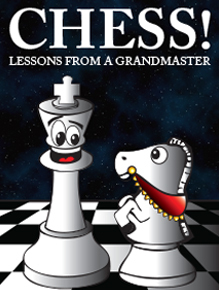 https://itunes.apple.com/us/book/chess!-lessons-from-grandmaster/id589939284?mt=11. Each student who completes this textbook develops a skill and a Chess Certificate honors the hard work, initiative and mastery of this skill level. GM Shulman who is also the 2008 US Chess Champion signs the award certificate. In order to inspire students to become service learners while also acquiring a skill we asked students to volunteer for a minimum of 20 hours in order to qualify for this award. Barrington Bank opens a Photography Exhibit celebrating our mission of education, service and philanthropy. Our talented volunteer Photographer Joseph Ridgway takes the exquisite photographs of our students during tournaments and some of these photos are on display at the exhibit. 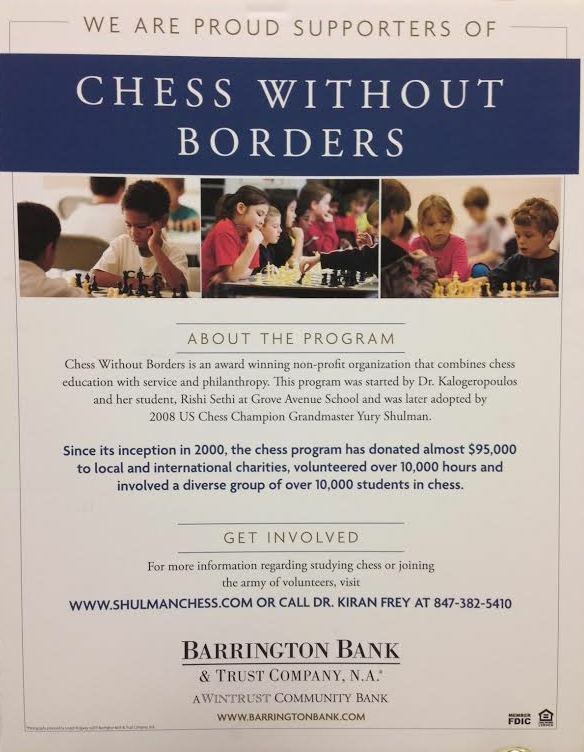 We encourage our chess families to visit Barrington Bank is located at 201 S. Hough Street in Barrington. Barrington Bank also has programs teaching kids how to save and while you are there please stop by to ask for information regarding the Junior Savers Club. There are special benefits to joining and as always we encourage our students to be intellectually curious exploring all possibilities. Together we have raised $96,070.60 for local and global charities!